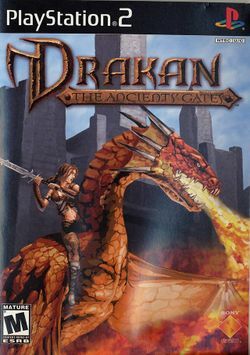 Drakan: The Ancients' Gates is an action-adventure PlayStation 2 game by Surreal Software. It is the sequel to the 1999 PC game Drakan: Order of the Flame. The game takes place sometime after the events in Order of the Flame. Rynn and Arokh answer a call from the city of Surdana. Lady Myschala of Surdana asks for Rynn and Arokh's assistance. An evil race of three-faced beings known as the Desert Lords have begun rallying the monsters from around the world (similar to how the Dark Union did in Order of the Flame) and have begun enslaving humans. Around the world there exist four gateways that lead to the world where the dragon mother, Mala-Shae, and her brood have been slumbering since the Dark Wars. Only a Dragon of the Elder Breed can open the gates and this is why Rynn and Arokh (more specifically, Arokh) are needed to open these gates, so that the humans can once again bond with dragons and fight back against the Desert Lords. Along the way, the two of them must go on various side quests to accomplish goals leading them to the ultimate goal. This page was last edited on 8 July 2016, at 18:48.